PROmotion Marketing, LLC is Committed to Diversity, Responsible Sourcing and Sustainability. 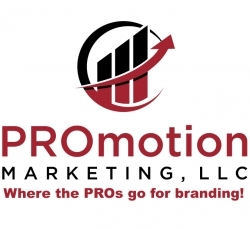 Palm Harbor, FL, January 15, 2019 --(PR.com)-- Sandy and George Chambers are proud to announce the acquisition of PROmotion Marketing of Florida, LLC, a promotional product distributor with a focus on building brand awareness for their clients. As a woman-owned business, the foundation of the company’s mission is a passionate commitment to fostering diversity and a high level of ethical standards in the promotional products industry. Over the last 30 years, Sandy and George, known among their professional associates as the "Dynamic Duo," have successfully launched new enterprises that have proven to become established brands in industries such as network marketing, financial services, and independent marketing organizations. In addition to the company’s product website, MyPROmoteam.com, PROmotion Marketing of Florida provides image creation, company brand launches, consumer focus groups, uniforms for every type of industry, fulfillment plus promotional welcome gifts, new hire packages and travel gift sets. “We don’t make promises, we deliver results," says George. With a network of over 3,000 production locations and warehouses, PROmotion Marketing of Florida is uniquely positioned to nimbly fulfill clients’ needs and goals while providing an exceptional level of innovation to capture attention and create memorable brand awareness. About PROmotion Marketing of Florida: Headquartered in Palm Harbor, FL, the company is a member of the Advertising Specialty Institute. For more information, call Sandy Chambers at (727) 626-2700 and visit the company website: MyPROmoteam.com.